Lynn Morris leader of the Lynn Morris Band, teaches our Clawhammer Banjo DVDs. She is a skilled bluegrass and clawhammer banjo player and teacher and is listed in the Masters of the Five-String Banjo book. Her tasteful and clean style of clawhammer banjo is a staple of her stage show. Lynn grew up in the small West Texas farming community of Lamesa, and began her professional life in music after graduating with a degree in art from Colorado College. She began playing the banjo within the next year, and became the first person to twice win the coveted National Banjo Championship in Winfield, Kansas. From there, she proceeded to build a remarkably varied and exciting career, performing full time throughout the United States, Canada and Europe, as well as touring military outposts in the Pacific and Indian Ocean regions for the U. S. O.
Noteworthy highlights include performances on the steps of the Library of Congress, Nashville's legendary Grand Ole Opry, The Aladdin Hotel in Las Vegas, Leavenworth Federal Penitentiary, and some of the most prestigious folk and bluegrass festivals in the world. Lynn was the first woman elected to the board of directors of the International Bluegrass Music Association, and has also served on the board of the S. P. C. A. in Winchester, Virginia (the launching point of Lynn's involvement with animal welfare on the national level). Petsmart Charities and Spay USA jointly sponsor Lynn's efforts, and the band's self-penned Public Service Announcement jingle, Spay Your Pet, is receiving airplay on hundreds of radio stations across the U. S. and Canada, even as far away as Australia. The band hosted its first annual 'Pickin For Pets' bluegrass benefit concert at the Birchmere in Alexandria, Virginia in May, 2002. Lynn's five CDs have earned the highest awards in the bluegrass industry - the title track of her 1996 release, Mama's Hand, held the number one spot in the National Bluegrass Survey chart for an amazing six months, and won the IBMA Song of the Year award, while the album enjoyed a remarkable 14 months on the charts. 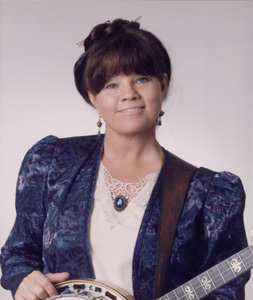 Lynn has been voted IBMA Female Vocalist of the Year three times and seven times Traditional Female Vocalist for the Society for Preservation of Bluegrass Music in America. Her recorded work appears on two IBMA Album of the Year compilation projects, and the group's CD, You'll Never Be The Sun, won the Washington Area Music Association's Best Bluegrass Album. Shape Of A Tear, released in 2003, was nominated by the IBMA for Album of the Year.